Each hole of the Augusta National Golf Club is named after one of the many trees, flowers, and shrubs which grow on the course. Some of the more representative names are Pink Dogwood, Flowering Peach, Yellow Jasmine, Juniper, Camelia, Firethorn, Chinese Fir, Carolina Cherry, and Tea Olive. The many Magnolias that bloom along the fairway and green of the fifth hole give it its name. And number thirteen is honored by Azaleas. The most demanding hole on the course, however - the twelfth - is designated as Golden Bell, but many are the players, it is thought, who undoubtedly refer to it in less glowing terms. So how did all of this flora find its way to one of the most prestigious golf courses in the world? It was already there. Soon after his victorious tournament year of 1930 in which he won the Open and Amateur championships of the United States and Great Britain, Bobby Jones decided to retire from competitive golf and build his own golf course. He wanted a course that would include all of the best attributes of the great courses on which he had won his championships: Merion, Oakmont, Winged Foot. He also wanted to invite his friends - professionals and amateurs with whom he had played - to share the course with him. And when he saw the old Fruitlands Nursery outside Augusta, Georgia, he knew he had found the right place. The 635 acre property was owned by a Belgian horticulturist, one Baron Von Berchmann, and together with wealthy financier Clifford Roberts, the two bought the land at depression prices. Situated in a valley near the border of South Carolina, it was much milder in the Winter at an altitude of 137 feet than his home town of Atlanta, and thus more amenable to golf. And it was already abundant with trees, flowers, and shrubs! The Augusta National was on its way. Based on his experience as a player of championship courses, Jones could have designed Augusta in any style he chose, and players would have accepted it; but he wanted to create a masterpiece. So he called in the architect who had designed a course Jones had recently played and admired - Cypress Point - and asked him to assist in the design. Jones and Alister MacKenzie soon realized that many of their ideas were the same, and they wasted no time in getting started. They both wanted rapid, subtle greens; a course that would test the best tournament players and yet prove enjoyable to average amateurs; and a design that would capture the spirit of the British links courses which they both loved so much. The Augusta National proved to be everything they had desired. By 1934, after the course had been allowed several years to mature, Jones decided to hold an informal tournament by invitation only and called it the Augusta National Invitational. The title lasted just four days. For over sixty years the tournament has been known as The Masters. Jones' main emphasis at Augusta was to create a course that made the greatest use of the natural phenomena of the terrain and did not rely on man made hazards, deep rough, and copious bunkers. 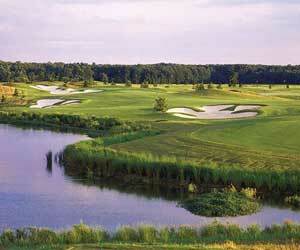 Consequently, the fairways are abundant, the greens are large, and the bunkers are few. The course is a prime example of the use of strategy; the golfer is challenged to think carefully before hitting each shot. Jones and MacKenzie gave the golfer the opportunity of playing each hole in several different ways, depending primarily on ability and willingness to take chances. A player could either 'go for it' or 'play it safe'. Strategic courses are designed to lure the unsuspecting golfer into difficulties if he tries for too much. The course becomes penal - as many courses are contructed to be - only if the golfer makes it so. To be on the wrong side of the fairway at Augusta is to give yourself a difficult shot to the green, and position on the greens is all important. Three and four putts are not uncommon here. Many players are surprised at how hilly the course really is. From an aerial view it seems almost flat, but there are plenty of hillocks to negotiate when one is playing it. And at the far extremities of the course lurk three holes upon which The Masters is often won or lost. Amen Corner, so named by golfer writer Herbert Waren Wind because if golfers negotiate these holes in par figures they are apt to whisper 'amen', consists of eleven, twelve, and thirteen. On the treacherous eleventh, Ben Hogan always aimed short and to the right of the green because of the pond on the left. He once stated that "If you ever see me hit the eleventh green in two, it means I have mis-hit my second shot." But Larry Mize was fortunate enough to chip in from fifty feet out to win a playoff in 1987. Twelve is a par three of about 155 yards which is played to a very shallow green guarded by bunkers front and rear and by a creek in front of these. Jack Nicklaus refers to it as 'the most demanding short hole in championship golf." The dogleg thirteen, a long par five, is equally as challenging. Many are the players who have gone for the green on their second shot and landed in the stream in front. But, if played properly, Amen Corner can be fortuitous. In 1937, Byron Nelson parred eleven, birdied twelve, and eagled thirteen to gain six strokes on Ralph Guldahl and eventually win the tournament with a fine 66. Perhaps if players said a little prayer to the Gods of Golf before negotiating these three awesome holes they might well reward themselves with a whispered 'amen' at their conclusion. Bobby Jones, in a very reflective moment, once said of Augusta: "There isn't a single hole out there that can't be birdied if you just think. But there isn't one that can't be double-bogeyed if you ever stop thinking." And, after all, isn't that what golf is all about?